There is no universal process for software development. As a custom software development firm, we have seen a wide variety of project scales: from two-week business automation web applications to 36-man-month mobile applications with hundreds of complex data processing screens, and everything in-between. One of the key dynamics in our success is staying flexible, so we can determine the best processes to meet client expectations and maintain stakeholder confidence. 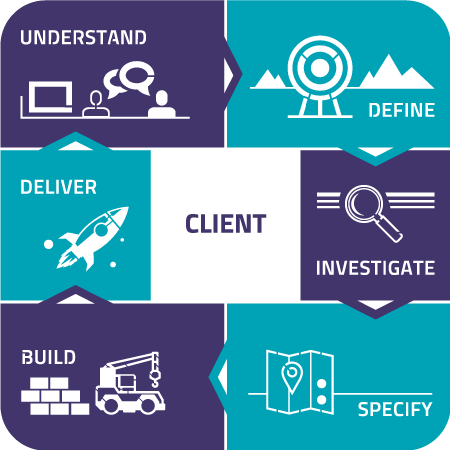 Digital Mettle works collaboratively with our clients to determine what portions of a solution need to be available and when. If the requirements create a trade-off or cause a risk from an engineering perspective, we are careful to outline those risk factors, so all stakeholders can make informed decisions. Once the appropriate process for the situation is determined, we maintain open lines of communication with our clients. This involves the frequent sharing of our project plans, ongoing internal documents, in-progress work products, and any new information that has come to light that could impact delivery dates. Early and detailed over-communication allows clients to set expectations with their stakeholders and customers, and is a critical component to successful long-term relationships.